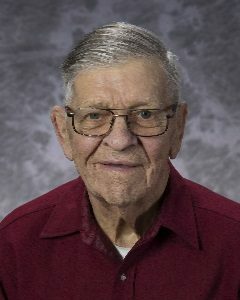 Roy Nygaard, age 90, of Litchfield, Minnesota, passed away Monday, January 28, 2019, at Fairview Southdale Hospital in Edina, Minnesota. Funeral Service will be held Monday, February 4, 2019, at 11:00 A.M. at United Methodist Church in Litchfield with interment in Litchfield (Ripley) Cemetery. Visitation will be held Sunday, February 3, 2019, from 2:00-4:00 P.M. at United Methodist Church and will continue one hour prior to the service at the church. Roy Nygaard was born on December 15, 1928, in Litchfield, Minnesota. He was the son of William and Mary (Dagmar) Nygaard. Roy was baptized as an infant and confirmed in his faith as a youth. He received his education in Litchfield, Minnesota and was a graduate of the Litchfield High Class of 1945. On December 29, 1956, Roy was united in marriage to Mary Ellen Peik at Zion Methodist Church in Brownton, Minnesota. This marriage was blessed with one daughter, Norma Jean. Roy and Mary Ellen resided on a farm in rural Litchfield. They shared 53 years of marriage until the passing of Mary Ellen on October 2, 2010. Roy was a lifelong farmer; He was also employed at First District Association, formerly known as Land O’ Lakes, in Litchfield. He was an active member of United Methodist Church in Litchfield. Roy was a world traveler and enjoyed spending time with his family and friends. He loved reading, Twins games, coffee at McDonald's with his friends, Christmas prime rib dinners. He also loved his many farm cats and dogs and never missed an episode of Wheel of Fortune. Roy passed away on Monday, January 28, 2019, at Fairview Southdale Hospital in Edina, Minnesota, at the age of 90 years. Roy is preceded in death by Parents, William and Mary (Dagmar) Nygaard; Wife, Mary Ellen Nygaard; Sisters, Lois White, Helen Mayer; Brothers, Robert Nygaard, Donald Nygaard.